If you read my last post on the García School, you may have caught the curious suggestion made by Anna E. Schoen-René that her luncheon partners, Blanche Marchesi and Nellie Melba, were unaware that the great García was still alive when he approached one-hundred years of age. Now that seems curious, doesn't it? One of the most famous voice teachers of all time falling off the map? No wonder his centennial birthday celebration was reported in every paper on the planet. Madam Marchesi left her own mark on vocal pedagogy with her curious book, The Singer's Catechism and Creed (1932), which I have written about before. Her main contribution is "sounding boards," a peculiar way of viewing the voice, and one that has definitely fallen by the wayside as modern vocal pedagogues have learned more about acoustics, the point being that the cavities of the head and chest have no part in making tone, the only resonator being the vocal tract. They are right of course. However, to stop there is to stop listening, cause and effect not being the same thing at all. This is something the Old Italian School understood quite well, though we consider them to be unscientific. Open Vocal Wisdom and you will discover that Giovanni Battista Lamperti believed the auditory sensations heard by the singer in the head to be an illusion. However, these same illusions were cultivated to the nth degree. Long time readers of VoiceTalk will know that I perceive the illusion of placement as having everything to do with the audition/proprioception of bone and air conducted tone. I believe this experience is what Madam Marchesi is addressing when she writes about "sounding boards." Here is a long extract by Madam Marchesi from The Singer's Catechism and Creed (1932) dealing with the matter. In the section entitled "Sounding Boards," it will be seen how even the use of the wrong sounding-boards will injure the voice. When I speak of F# as the first head note for women, and of Eb, E and F, etc., for the covered tones of men, I always refer to low pitch. In high pitch, which makes a different semitone, the registers must be transposed accordingly. Can people possess voices and use them naturally without having been taught? Yes, there are a few exceptional voices in the world which seem to have been placed in the right positions by nature. They are the product of a perfect formation of the whole instrument and its surroundings, of a perfect relationship between voice and sounding-boards. With most singers however, teaching alone is capable of placing the voice correctly. Even where nature has placed a voice to perfection it must be trained, because, as it also lies within its capacity to do the wrong thing, the right method must be shown in order that singing, exercised with full knowledge of the rules, may maintain the voice in perfect condition until life is extinct or health fails. When the breath is properly taken and sound produced, where does it go? The air carrying the sound that leaves the inner larynx can escape through the mouth or nose. Which is the right channel to be used? For singing, only the mouth. Because the sound must find sounding-boards on its way out, and the inside of the nose cannot act as a sounding-board. The nasal bone, which, together with the frontal and facial bones, is a sounding-board, is not touched when sound is sent through the front nostrils. Another reason why the nose must be avoided as an escape of sound is that the voice passing through this channel acquires an ugly, unaesthetic quality. A body capable of receiving sound and of vibrating when touched by the sound-waves. The material of which the sounding-board is made partly determines the quality and quantity of sound produced. Instruments constructed to make comic or weird noises have sounding-boards of various materials and shapes. What material is best for a fine, noble sound? Vibrating glass, brass, wood, or bone may form a sounding-board. Such materials as marble, cement, or stone kill sonority, as they cannot vibrate and thus repulse sound-waves. Cardboard, wooly or other soft materials are bad, as, being incapable of vibration, they deaden and muffle the sound that meet them. Consequently, sounding-boards of instruments are chosen from wood, metal, or bone. Which, then, is the sounding-board for the human voice? For the interior sounding-board there is only bone. For exterior sounding-boards the surroundings will vibrate according to the nature of the objects that fill the room. Which are man's interior sounding-boards used in singing? Every bone that lies in the vicinity of surroundings of the larynx serves as a sounding board. The chest and collar bones give sonority and vibrate with the chest notes of both men and women, where the larynx stands at its lowest. In the medium voice of women (second register) there would alway be a variety of impossible tone-colours if the sound were not sent straight to the hard palate (front palate behind the upper front teeth). The back part of the palate (bearing the uvula), being soft, cannot be used except for the production of certain effects demanding weak, colorless tones. What sounding-board is used for a woman's third, the head, register? By sending the head note high up at the back, opposite the uvula, the tones strike the vault of the pharynx connected with the nose and frontal bones, as well as with the whole skull. The head voice is so called because of its resonance in the head bones. Where do men's voices find their sounding-boards? Man sings from his lowest to his highest note in his first, or chest register, all the vibrating chest and neck bones acting as sounding-boards. When he covers his chest tones about Eb, E natural, or F, the vault of the pharynx becomes his sounding-board, and partly the hard palate. If he uses falsetto, his tones also vibrate in the frontal, nose and skull-bones, like the head notes of women. Can one sing without sounding-boards? Certainly not; no instrument can do without them. The singer, too, must look out for the most advantageous vibration, both interior and exterior. How does a singer find his sounding-boards? Only by being shown by a wise instructor, or if very clever, by following closely instructions put down here. The sounding boards are found in pronouncing certain vowels, and the voice must be trained to place every note in it's proper register, supported by its own sounding-board. In the first, the chest register, men and women must use the Italian ah. In singing out a full, deep note, on ah, the first sounding-board will be struck. If the hand is placed flat on the sternum near the collar-bone, the vibrations of these bones will be felt in the hollow of the hand. The vowels i, eu, and oh (Italian pronunciation) would crush the chest tones and produce an irritating pressure. The pupil must learn to manage all the vowels equal to ah in the chest register. This refers especially to female voices. Men, who sing their whole scale in chest voice, easily manage not to cover and accentuate dark vowels until they reach the point where covering is required. Women, who change into the medium (second) register on about E or F, sing a whole octave to the top F# exclusively in one register. In changing from chest to medium, they use the French u or German ü, resembling the Italian i, but placed behind the front teeth, keeping the lips limp and dropping the lower jaw. The higher they sing the wider they must open their mouths, thus giving more space for the vibrations to escape through contact with the hard palate. Passing into the head notes on F#, the chin must be dropped completely and the mouth opened wide. For this, the third register, a clear open ah must be pronounced in order to strike the third sounding-board (the bone forming the end of the spine, called the vault of the pharynx and connected with all the skull-bones). If this sounding-board is not struck, and force is applied, the larynx will fall back into second position, and the inner network of the arytenoid muscles and cartilages will be working in opposition to the muscles that decide the three positions of the larynx. Great effort will ensue, and the consequence will be vocal derangement. The inner workings of the sound-producing muscles must be in constant harmony with the working of the lifting muscles. The use of the wrong sounding-board is not so detrimental to the voice as the misapplication of the registers, but its avoidance is of high importance, as no muscles can develop unaided by sounding-boards. Men, in running up the scale, change their sounding-board but once and so find much less difficulty than women, who are faced with a threefold change of register and sounding-board. For men, the ah goes on undisturbed until they come to the notes which require covering. The change from open to covered chest notes will easily be acquired by changing the ah into a dark vowel like i (Italian), or e, o, or u (Italian). The vowel best suited to that purpose must be chosen, as the case may require. Should a man cover all his voice instead of only the top notes it will never develop, but shrink and deteriorate. If he opens his top notes using the first, or chest, sounding-board, he must lose his voice and in any case develop a terrific tremolo. If a woman covers her chest notes, the pressure thus exercised on the whole larynx to keep it in the first register and the use of the hard palate instead of the chest bones as sounding-board will muffle the voice and even produce laryngitis and other inflammations. If she uses her chest sounding-board on ah for the second register without leaving the first chest register, she will simply go up the scale in chest voice, like a man. If she uses the third sounding-board for the second register, she will sing medium in head voice, and if she uses the second sounding-board (the hard palate) by singing dark vowels on her head notes, she will ruin her voice by sending it back to the second (medium) position. It is because all these faults are committed that one constantly hears of voices which have been ruined. —Blanche Marchesi, The Singer's Catechism & Creed (J. M. Dent & Sons LTD, London), 1932: 21-25. There is, of course, more to this passage, and, indeed, to Madam Marchesi's book, which I encourage the reader to find by seeking out a good music library. Barring that, the material above offers the student of the García School an essential teaching, which can be deduced from the similarity between Madam Marchesi's instruction regarding the use of ah, and that of Hermann Klein, the latter having recorded his thoughts in Hidden in Plain Sight: The Hermann Klein Phono-Vocal Method Based Upon The Famous School Of Manuel Garcia (VoiceTalkPubliciations, 2013) under the heading "Singing Position." There, Klein writes "the true singing position, or that adjustment of the vocal mechanism which will yield what we term a "good note" is found by uttering "the vowel "ah" in the speaking voice." He then goes on to say that "this sound should be done with firmness of utterance, not very loudly, but upon what seems to be a rather deep, reverberate sound" while also noting that the "singing position which gives the comfortable lower notes is precisely that which the voice requires throughout its entire range." Klein's words echo those of Marchesi, who cuts to the quick when she instructs the pupil to "learn to manage all the vowels equal to ah in the chest register." This is an essential element of the García School of singing, as well as a feature of the Old Italian School of Singing, which finds expression in the teaching of Francesco Lamperti who reportedly said: "If you aren't singing ah from the bottom of the throat, you aren't singing!" It's a simple concept really. But getting the student to do it over and over again correctly is another matter, since ah can be, and often is, a most difficult vowel to sing and speak clearly. What brings about beneficial change? The use of Italian tonal values, which lead to the acquisition of "pure vowels," a concept unknown to many. 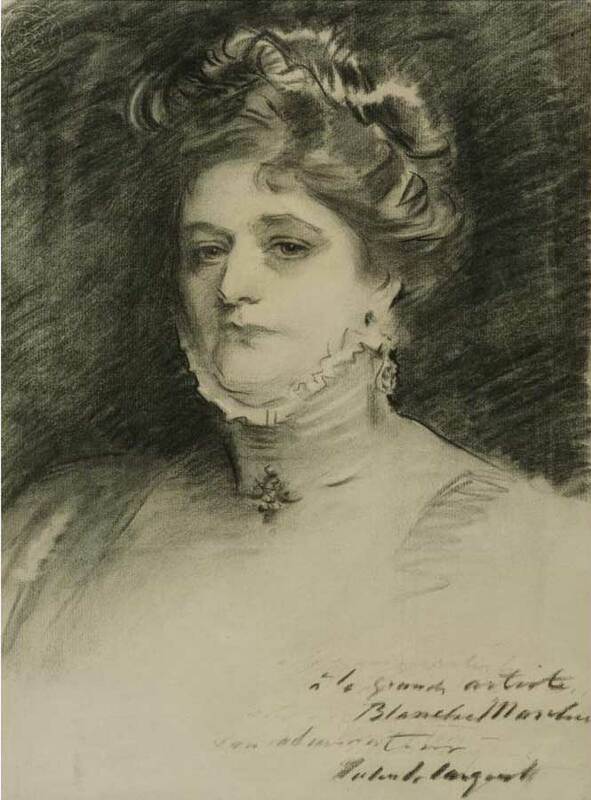 Photo Credit: Wikipedia: Blanche Marchesi as rendered by John Singer Sargent.